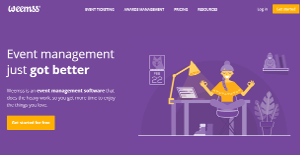 Weemss is a unified ticketing and event registration solution that addresses all conceivable ticketing and registration needs of event organizers and professionals. It is also designed to function as an awards management platform, providing event organizers and managers with an additional functionality that is highly useful for their line of work. Weemss doesn’t require extensive training from its users as it flaunts an incredibly user-friendly, fast, and intuitive interface. Users don’t have to go through a steep learning curve to familiarize themselves with the platform. The software enables event organizers and managers to create, promote, sell, and manage their events in 200+ countries, with 160+ currencies and 40+ languages available. Weemss provides you with complete control and greater freedom over your events and awards competitions. The solution enables you to receive your payments immediately after each sale, talk and interact with your clients without any third party standing in the middle, access and retain all of your clients’ data and determine what features and capabilities to utilize and how. With Weemss, you have various options on how to accept payment. The software supports a number of payment methods, including 6+ payment gateways and custom offline payment options like bank transfer, cash, pay at the door, pay by invoice, pay later, etc. Customer support is topnotch. Weemss offers instantaneous and excellent support for their users. With Weemss, you can eliminate the usual queues and get your guests fast and easy inside the event area, reception, concert hall, etc. That’s because Weemss provides express check-in via a barcode scanner or a mobile app, simplifying and speeding up the check-in process. Creating floor plans and seating charts and ensuring that your guests are seated and your venue is not overbooked are all essential in making your events and award shows a success. Weemss lets you do all that and more, ensuring that you guests have an awesome experience and you have a breeze managing all aspects of your events. What Problems Will Weemss Solve? 1. Weemss speeds up processes pertaining to managing an awards show. Back then, everything is slow and tedious. From people submitting entries by email and then entries forwarded to judges for scoring and valuation to calculating the scores, the whole process is time intensive. Weemss streamlines and accelerates everything from submission, judging, voting, etc. 2. With Weemss, event organizers from all over the world can enjoy a powerful ticketing and events management platform that supports their language and local currency. 3. You can connect Weemss to over 800 of the world’s most popular and widely used business applications and systems. That means Weemss provides you with flexibility and versatility to work with your existing systems, streamline your functions, and reach your goals without having to change your workflows and processes. If you are considering Weemss it may also be beneficial to check out other subcategories of Best Event Management Software gathered in our database of B2B software reviews. Each business is different, and may call for a special Event Management Software solution that will be fit for their business size, type of customers and employees and even individual industry they cater to. We advise you don't count on getting an ideal app that is going to be suitable for each company no matter what their background is. It may be a good idea to read a few Weemss reviews first and even then you should keep in mind what the service is supposed to do for your company and your staff. Do you need an easy and intuitive solution with only essential features? Will you actually make use of the complex functionalities needed by pros and large enterprises? Are there any particular tools that are especially useful for the industry you operate in? If you ask yourself these questions it will be much easier to locate a solid solution that will match your budget. How Much Does Weemss Cost? We realize that when you make a decision to buy Event Management Software it’s important not only to see how experts evaluate it in their reviews, but also to find out if the real people and companies that buy it are actually satisfied with the product. That’s why we’ve created our behavior-based Customer Satisfaction Algorithm™ that gathers customer reviews, comments and Weemss reviews across a wide range of social media sites. The data is then presented in an easy to digest form showing how many people had positive and negative experience with Weemss. With that information at hand you should be equipped to make an informed buying decision that you won’t regret. What are Weemss pricing details? What integrations are available for Weemss?